Wang’s first novel written in English: a compelling account of the emotional and political awakening of a tormented young Chinese woman who grew up during the Cultural Revolution. When her parents, music teachers from Beijing, were sent to the countryside for “re-education,” 12-year-old Lili was ordered to spy on them, and was eventually raped by the Party Secretary. At the opening of this bracing first-person tale, time has passed and Lili is in prison for corrupt lifestyle and hooliganism. Released, she moves in with her parents, now back in Beijing, where they live a “domestic cold war.” Embittered and frustrated, Lili finds pleasure only in playing the erhu, the Chinese violin, until she meets Roy Goldstein, an American journalist with a passion for China and soon for Lili. His work takes him around the country, often accompanied by Lili, meeting peasants, artists, and monks—and giving the author an opportunity to depict life in late-1980s China, something she does with skill and sensitivity. Roy is an endearing character, gentle and sweet, constantly challenging the status quo yet at times hopelessly naïve (e.g., when his well-meaning attempt to adopt an abandoned baby girl ends in tragedy). But the strength of this insightful story lies in the transformation of Lili; respected and loved for the first time in her bleak and marginal life, she begins to feel Roy’s hope. And during the occupation of Tiananmen Square, she’s drawn to the students’ conviction; she can’t stay away. At the close, Roy has been deported, and Lili and her father are witnessing the massacre together. 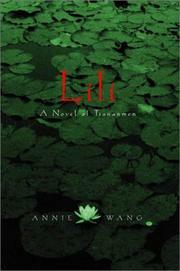 A moving and well-crafted tale, written over the course of ten years, that successfully melds the fictional Lili with China’s recent history. Not an easy task.